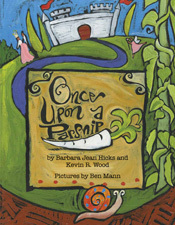 Have you ever wished for a magic wand you could wave over your kids to get them to actually like eating healthy foods? Magic Fruit Wands just might do the trick! 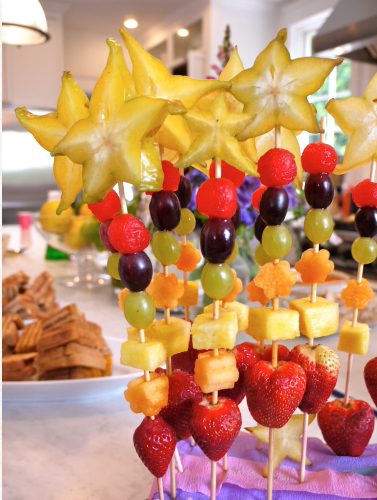 There’s nothing like time in the kitchen to get kids’ mouths watering–especially when they’re helping to put together something as easy, fun and fresh as these magic wands made out of fruit. The best part is that after you’ve cut up the larger fruits, your kids can make these special treats almost entirely on their own. The recipe is adapted from weelicious.com, where chef Catherine McCord reigns supreme. It’s a marvelous site, filled with healthy, kid-friendly recipes of all kinds. I’ve signed up to get posts in my inbox on a regular basis. I think you’ll like it too! Watermelon’s distinctive striped outer shell and the rich color of its flesh make it a fun food for coloring. 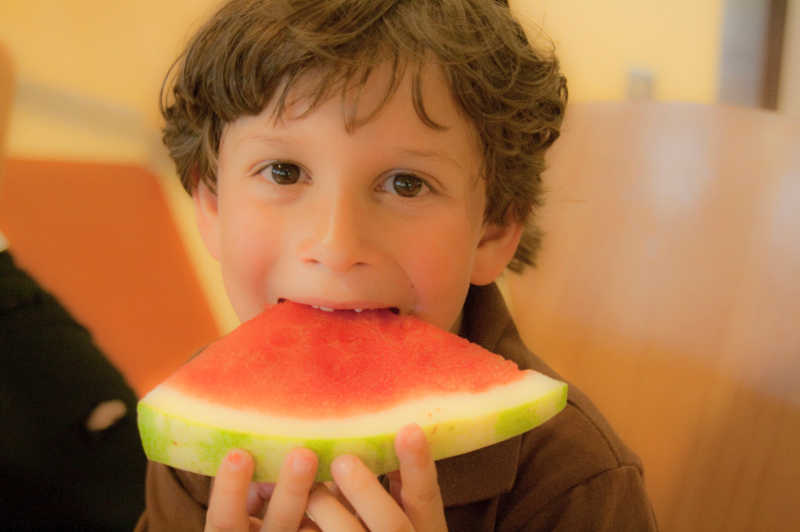 But before you get the red crayon out, take your kids to this UCLA Science and Food website post on watermelon to show them the fruit comes in other colors, too. Who knew?! According to the article, a watermelon’s flavor has a lot to do with its color. A yellow Early Moonbeam, a pale Cream of Saskatchewan and a deep red Crimson Sweet have noticeably different flavors, for example. I’m not sure if that painting got anyone to move to California, but I’m guessing a few. Some people will believe anything! Below you’ll find three still life paintings that depict watermelons in very different styles. Two are by well known artists and the third is a tabletop painted by an unknown Mexican folk artist. Ask your kids to observe the paintings closely. Which one do they like best? Why? 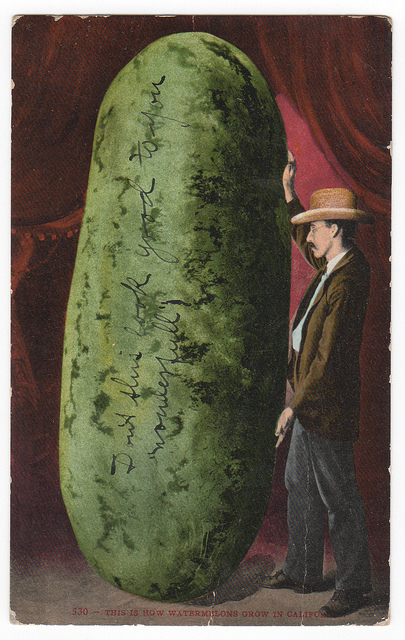 What other fruits and vegetables can they find in the paintings? Have they tried them all? Plant a Seed & Watch It Grow! What’s better than bringing home a watermelon from your local grocery store? Picking one out at the Farmers’ Market or picking one off the vine at a U-Pick farm. What’s even better than that? Picking one from your own garden! 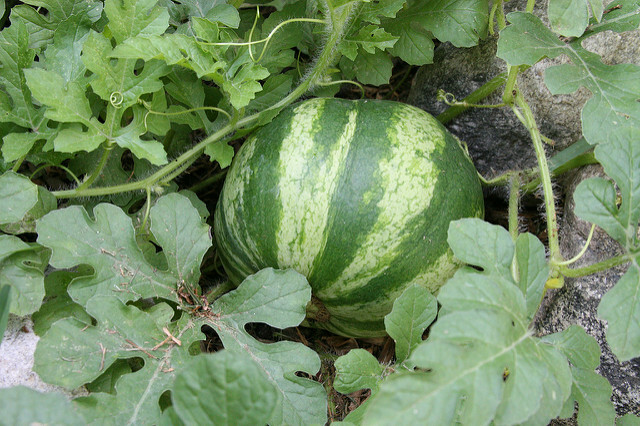 Watermelons need lots of room, as they grow on a vining plant. In a small space, you can grow them upright in a pot on a trellis. As the fruit grows, you’ll need to use netting, stretchable cloth or a bag to create a hammock to support it. What’s more refreshing on a hot summer day than a slice of juicy watermelon? Yum! 1. 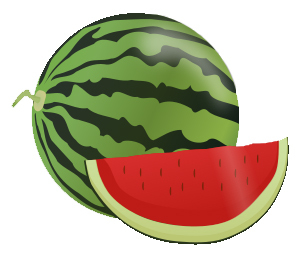 Watermelon is well named–it’s 92% water! All text and images on this website © Barbara Jean Hicks 2005 - unless otherwise identified. Text and images may be used for educational and other non-commercial purposes if copyright and website information are clearly stated. Commercial use of all text and images is strictly prohibited.